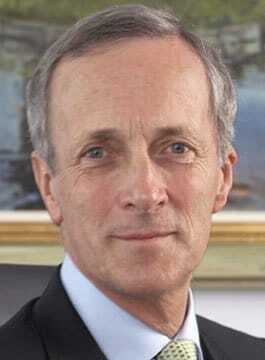 Sir Stuart Hampson was chairman of the John Lewis Partnership for 14 years until his retirement in March 2007. Sir Stuart is one of the longest serving and most successful leaders of a blue-chip company. Sir Stuart joined the partnership in 1982 following a twelve-year career in the Civil Service. In 1986 he was appointed to the Partnership’s Central Board as Director of Research & Expansion and took charge of the Partnership’s development programme. The Deputy Chairmanship was added to his Partnership responsibilities in 1989 and he became the fourth Chairman of the Partnership in 1993. During those 14 years at the helm of JLP, Sir Stuart presided over a courageous programme of modernisation, and all without sacrificing the partnership ethos and principles that were embodied in its 1929 constitution co-ownership and the happiness of its staff. The partnership’s 2006 results, announced shortly before Sir Stuart’s departure at the end of March 2007, are a testament to his efforts. Pre-tax profits hit a new high of £319m, up 27 per cent on the previous year, and the 68,000 staff – or “partners” – shared a bonus of £155m, up 29 per cent from 2005 and equivalent to 18 per cent of salaries. A founding deputy chairman of London First and past President of the Royal Agricultural Society of England, Sir Stuart Hampson is President of the Employee Ownership Association and continues to champion the benefits of employee engagement in business. "Sir Stuart was an excellent engaging speaker and we all got a lot out of his speech... so much so, we've invited him back to our leaders conference!"